All Indian football fans can watch some exciting football moments from Lionel Messi and Argentina football team on September 2 in Saltlake Stadium in Kolkata. This was a friendly match between Argentina and Venezuela. We all see the skills and tactics of Messi in TV but now its a chance for Indian fans to see the live action of Messi in you nearest place. As per the latest news the match will be started at 7 p.m. Kolkata is also famous for having some great footballers in their state like Diego Maradona, Lothar Matthaus, Oliver Kahn, Karl-Heinz Rummenigge, Gerd Muller, Romario and Branco. This match not only provide an enjoyment for Indian Football fans butalso a great support for Indian Football team to boost their performance. The tickets price of Argentina and Venezuela in Kolkata is reasonable and not high. The ticket price starts from rs 700 and the highest ticket price is 50000(Hospitality). In Upper tier You can buy Rs.700 and Rs.1000 tickets. Middle tier includes tickets of Rs.2470, Rs.3590,Rs.5120. Lower tier tickets are divided into Rs.1860 and Rs.2570. Hospitality is VIP class and the rate is Rs.50000. This is the latest updated price and is fixed currently. "We are planning to introduce a family block in Yuba Bharati Krirangan from this match. With this a family can buy out tickets at a discounted price." "We are not the organizers so we cannot decide on that. Of course, to see Messi in action comes at a price, but Rs. 1,000 is a little too high,"
"The agency which laid out the turf agreed to do it for free. They would smoothen the surface. The work will take about four weeks' time, so it will be started accordingly." As per the latest information Argentina and Venezuela match will be shown in Doordarshan. The match is expected to start at 7 pm onward, So that you can watch the Live coverage from your home itself. 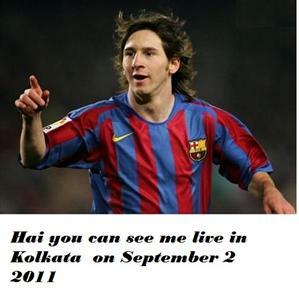 This is the best chance in your life to see your favorite Messi and team live near your city. So book your tickets early as possible from the details given. You can book your Argentina and Venezuela in Kolkata match tickets online for seeing as well as from the ticket counter. You can book your tickets from the counter(Mohammedan Sporting ground) from August 3 onwards and online booking is available from July 30 onwards. Tickets are divided into 4 categories namely Upper tier, Middle Tier, Lower tier and Hospitality. "The Argentina Football Association had indeed signed a contract to bring in the full-strength squad including Messi and Carlos Tevez among others. So the contract guarantees their participation,"
"We were given the match in condition that we have to buy another. We did not think twice and bought both the matches just to make Messi play in Kolkata,"
"We are also planning several other events which will be announced later. We are thinking of a minimum ticket price of Rs 1000 — about $20, a nominal price compared to the ticket prices in other international friendlies." "Those who could not afford to make the match, we would give them another chance for both the teams practice sessions the tickets of which would be at a cheaper price,"
"The stadium is completely in a mess. The garbage there has been piled up for 34 years. We are leaving no stone unturned to make the stadium international match-worthy,"
"It's difficult to give YBK a complete facelift in such a short period. Our list of priorities includes better toilets, changing rooms and passage ways. We will also bring a generator from a Chennai firm to avoid the frequent blackouts in the stadium,"
"The match would be a turning point in India's football history". "This would inspire others to organize more such matches. It's going to be a historical day,"